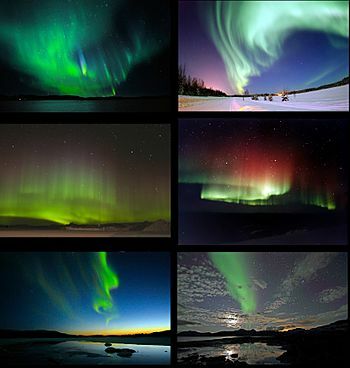 An aurora, also called polar light or northern light, is a natural light display in the sky. They are usually seen in the high latitudes (Arctic and Antarctic) regions. Auroras are produced when the Earth's magnetosphere is disturbed by the solar wind. 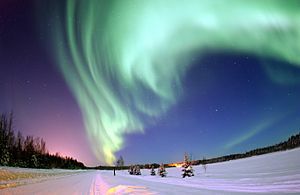 An aurora around the North Pole is called the Aurora borealis or 'northern lights'. Around the South Pole it is the Aurora australis or 'dawn of the south'. It can be seen from long distances, stretching in the sky many hundreds of miles. Auroras can only be seen at night because their light is not as strong as the light of day and faint stars can even be seen through the aurora. However, they can also happen during the day. An aurora occurs when the Sun sends off particles into space. These particles are mainly electrons, with charge and energy, which means they contribute to electricity. Earth has a protective shield of energy around it. This is called the "magnetic field" and forms an elongated sphere around the Earth called the "magnetosphere". The Earth’s magnetic field keeps off most of the solar wind. At high-latitude areas (polar areas), the magnetic field is vertical. It does not keep off particles of the solar wind which can come from the magnetosphere and hit the particles of the air (Earth's atmosphere). When they hit, the atmosphere is heated and excited and the excess energy gets away, a phenomenon which we see as moving lights in the sky above 100 km altitude typically. An aurora can be especially bright following a solar event called a coronal mass ejection (CME), when the charged particles rip through the electromagnetic field because of their power. Jupiter aurora; the far left bright spot connects magnetically to Io; the spots at the bottom of the image lead to Ganymede and Europa. Aurora Facts for Kids. Kiddle Encyclopedia.